Intellect is an award winning leader in SaaS Business Process Management (BPM) software. As such, Intellect empowers everyone to innovate by enabling business users with no programming skills to create, deploy, and manage Smart Enterprise Apps, ranging from simple to mission-critical apps. The app-centric Intellect 8 BPM Platform offers the industry’s most intuitive solution for connecting apps, people and processes. Intellect’s main product is Intellect Accelerate, touted as an award-winning leader in the Platform-as-a-Service (PaaS) software industry, and offers the world’s fastest solution for building business apps, thanks to its no-coding, drag and drop business app development environment. Thus, it enables users to create business apps with forms, data, workflow, customizable reports, and integration. Intellect empowers everyone to innovate, as its drag and drop technology allows users to create simple to mission-critical apps, without the need for programming. 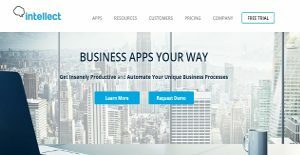 Its Accelerate Platform and pre-built IQ apps, not to mention its an entire library of business apps ranging from simple to highly complex, mission-critical apps, offer the industry’s most intuitive solution for connecting data, people and processes. Intellect business apps can be deployed on the web and as a native mobile app in minutes on any iOS and Android device. It is rapid to launch for organizations with constrained or limited IT resources. Intellect also helps in automating processes with advanced and yet easy to use workflow. Users can assign tasks and actions to individuals, teams, or roles that have been set up. Real-time data is also available for users to keep track on the progress of a task. There is also the option to integrate through business logic, web services, XML and simple LDAP/AD integration. Finally, Intellect provides a robust and scalable platform built on Microsoft.NET. You can instantly build a Microsoft SQL database in the back-end that can be easily repurposed depending on your needs. The platform empowers users to be able to design custom, dynamic reports to gain real-time insights into your operations, and make smarter and faster decisions. If you are considering Intellect it may also be beneficial to investigate other subcategories of Best Business Process Management Software gathered in our database of B2B software reviews. Since each enterprise has unique business wants, it is prudent for them to refrain from seeking a one-size-fits-all perfect software system. Needless to say, it would be pointless to try to find such a platform even among market-leading software platforms. The smart thing to do would be to jot down the various vital elements that need consideration such as required features, budget, skill levels of employees, company size etc. Then, you should do your research thoroughly. Read some Intellect reviews and investigate each of the other apps in your shortlist in detail. Such comprehensive research can make sure you weed out ill-fitting systems and zero in on the app that offers all the aspects you require for business success. How Much Does Intellect Cost? Intellect’s enterprise pricing information is available only upon request. Please contact the company for further information. We realize that when you make a decision to buy Business Process Management Software it’s important not only to see how experts evaluate it in their reviews, but also to find out if the real people and companies that buy it are actually satisfied with the product. That’s why we’ve created our behavior-based Customer Satisfaction Algorithm™ that gathers customer reviews, comments and Intellect reviews across a wide range of social media sites. The data is then presented in an easy to digest form showing how many people had positive and negative experience with Intellect. With that information at hand you should be equipped to make an informed buying decision that you won’t regret. What are Intellect pricing details? What integrations are available for Intellect? If you need more information about Intellect or you simply have a question let us know what you need and we’ll forward your request directly to the vendor.